You love your car, but you hate to hear the sound of your exhaust while you’re driving. You need to find yourself a new exhaust resonator. Even for pros, it’s hard to tell exhaust resonators apart. Aren’t they merely a metal tube? 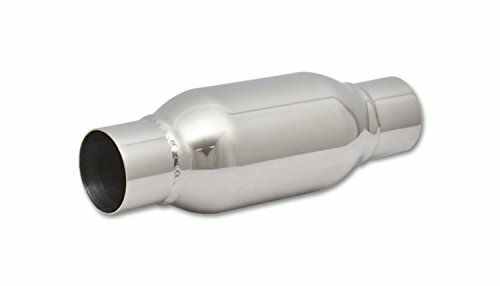 How different can one exhaust resonator be from another? In this article, we’ll dive into these questions and more. First, we’ll review a handful of exhaust resonators. Then, we’ll explain what is important and what isn’t. You’ll be ready to pick out a resonator by the end of the article. How Long Should My Exhaust Resonator Last? Which Hazards Does A Resonator Have To Endure? How Do I Avoid Damaging My Resonator While Installing It? Are All Exhaust Resonators Compatible With All Cars? So, you now know a bit about what the market for exhaust resonators looks like. But what do you need the most when you are trying to find the perfect exhaust resonator? First, you’ll need to ensure that any resonator you pick fits in the space under the car. Not all resonators are of the same dimensions, and there is no real standard size. It is very possible that you will pick a resonator that is awkwardly long or far too wide if you are not careful. If you aren’t sure what kind of resonator size will work and you can’t measure the area on your car for some reason, you will usually be fine if you purchase a bottle-type resonator. Next, you’ll need to decide whether your resonator should make your car more quiet or whether it should make your car sound cool. There are a few resonators which make your car slightly quieter and also impart a customized sound, but these are few and far between. For most purposes, people will be better served by quiet resonators. If you are building a racing rig, however, quietness probably isn’t a priority. Choose accordingly. Third, you will need to make sure that your exhaust resonator is durable. The resonator sits in an area which is exposed to a lot of environmental hazards from outside the car, not to mention the hot exhaust gases and particulates from the combustion of the engine. This is where the lightweight materials tend to falter. Heavy-duty exhaust resonators will add some weight to your car, but they will also fare the hazards of the environment much better. Lightweight materials are not necessarily going to rust away or become chipped immediately, but in extreme conditions, they won’t fare as well. For racing applications, a lightweight resonator is usually preferable because it will only be used in controlled conditions. Finally, your resonator needs to look acceptable. While the resonator isn’t the most obvious part of your car at a glance, a good looking resonator will round out the rest of your rig. Everyone has seen rusted mufflers which are decrepit. It isn’t a good look. The best resonators can either blend in or add a bit of accent to your car. The choice is yours. The Vibrant 1141 2.5″ Ultra Quiet Resonator emphasizes quietness and quality to make a powerful exhaust resonator that will get you attention for its looks. The Vibrant Ultra Quiet Resonator is built with a straight-through style core, stainless steel alloy, and an entire complex of sound-dampening materials in the jacket. With this resonator, you will get a compact package with 4 decibels of noise elimination. The biggest advantage of this resonator is the high amount of noise dampening. There will be a palpable difference which you won’t need to talk yourself into hearing. The secret is that the t304 stainless steel housing of the resonator provides an additional measure of noise reduction. Likewise, the jacket around the core is welded rather than molded. Because it is welded, there is not any consistent reverberation from the resonator itself. It’s tough to quantify this advantage, but it’s important to recognize that these little features add up to a large amount of sound reduction. 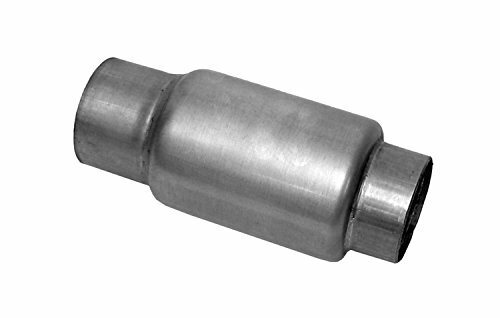 The Dynomax 24250 Race Mini Bullet Muffler is a compact and lightweight resonator which combines proven low-tech features with noise-reduction intended for racing. The Dynomax has one defining feature: compactness. Especially for cars that have a limited amount of trim room underneath the car or horizontally from the car, this resonator is a winner. You won’t need to worry as much about making it fit in a tough spot. This resonator also brings some strong noise reduction to the table. You can expect up to 4 decibels of noise reduction even while using it in a racing environment. Even when you gun the engine, this resonator will hold up. 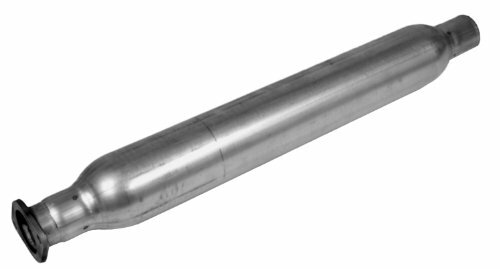 The resonator is welded and features a wide-mouth port at both ends to ensure high throughput of exhaust clearance even with its compacted length. While the primary compacting features are length reduction, the width of this resonator is a bit larger than others. As a bonus, this resonator is available for a very affordable price. If you need a resonator for racing, it’s tough to find a better one. The Walker 21398 Resonator Assembly is a long and narrow resonator intended to provide a customized sound for vehicles with the undercarriage space to mount it. The Walker resonator assembly is thin, long, and made with a unibody design rather than a welded design. Two things immediately jump out: first, the focus of this unit is not noise reduction, but rather noise modulation. This resonator opts to provide your vehicle with a specific timbre rather than a quieter timbre, though there is a measure of noise reduction. Second, this resonator is easy to install, unlike others. The flanged design and mounting bracket points make for a much quicker installation than others which require welding or careful fitting. So while this product may not be the best to make your car purr quietly, it is a highly effective DIY solution when it comes to making your car sound awesome. The reverberation effect caused by the unibody design contributes to the killer sound. You’ll still get a couple of decibels of noise reduction with this unit, however. The main challenges of this unit will be corrosion. The alloy that the unit is made from is intended to be lightweight and have ideal sound characteristics, but it is not extremely durable. You should check the unit frequently for contaminants and remove them promptly. 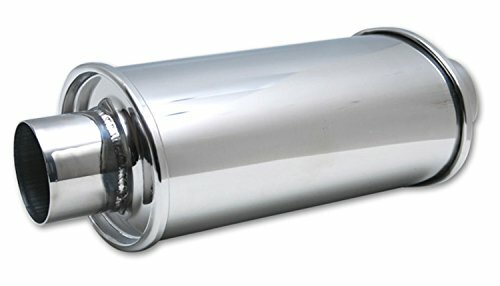 The Vibrant 1792 Bottle Style Resonator is a technologically advanced and beautiful exhaust resonator which provides durability alongside noise reduction. Like other bottle-style resonators, the Vibrant resonator is a bit fat and a bit stubby. The chrome look of this resonator is very hard to beat, however. The shiny quality of the resonator is derived from the stainless steel alloy that it is made out of. Like the other Vibrant resonator, this unit is welded rather than unibody. Likewise, its wide-mouth design makes for effective throughput when racing. As far as bottle-style resonators go, this resonator is a bit heavy. This means that it might not be the ideal resonator for racing, despite its aesthetic appeal. Likewise, this resonator isn’t the best when it comes to noise reduction. You’ll get a few decibels of noise reduction but probably not as much as you might want. Where the Vibrant resonator shines is that it is a generalist. There is no specific task that it fares poorly at, nor does it shine in any particular niche aside from aesthetics. This makes it very versatile. If you aren’t sure which exhaust resonator to get after reading this article, you should circle back and purchase the Vibrant resonator because it will most likely suit your needs. 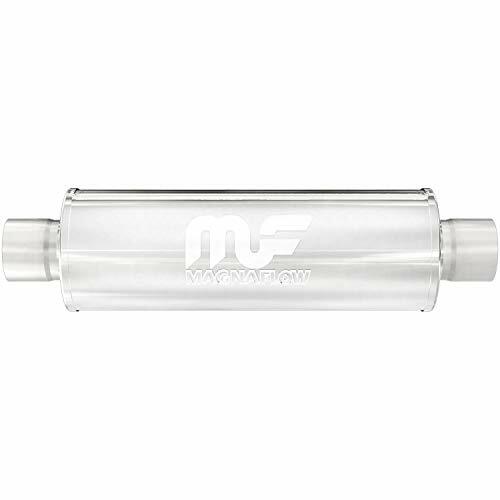 The MagnaFlow 10416 Exhaust Muffler is a heavy but effective resonator which opts for a customized sound rather than sound reduction. The MagnaFlow resonator is unique because it is a bit longer than a standard resonator but also a bit wider. This means that you will have trouble fitting it into compact spaces. On the other hand, if you manage to fit it, the MagnaFlow resonator makes a wonderful sound. Your engine will sound like a purr. The resonator both quiets and modulates your engine noise, and it’s truly an excellent result. The main issues with this resonator are its size and also its unibody design. There are areas on the resonator that will accumulate grime and dirt, which will be a problem in the long run. Likewise, despite being wider than normal resonators, this resonator does not have a mouth that is wider than average. So while it will be sufficient to disperse exhaust in most applications, racing applications may be underserved by this resonator. Your exhaust resonator can theoretically last 20 years, but it might not look very good by the end. The more strenuous use conditions will put a toll on the best resonators, and they should never simply fall apart or break. The more you put your resonator through extreme conditions, the more it will become discolored and potentially rusted. With enough abuse, it might become warped. Higher quality resonators will maintain their good appearance a bit longer than bad ones. Extreme cold or heat will put a higher toll on the resonator, as will salted roads or racing. The most consistent hazard to your exhaust resonator is the heat from your engine and the particulates from the exhaust. The temperature of the exhaust is about three fourths of the temperature of the explosion in the engine chamber. While the exhaust cools rapidly as it moves through the resonator, the resonator is stressed by the heat in the meantime. The heat stresses are also not symmetrical. The part of the resonator closer to the engine will be far hotter more frequently than the outer end. For the most part, the heat of the engine will be far greater than any environmental changes in temperature. Over a long enough period of time, however, a hot environment can contribute to the weakening of the resonator. Transitioning from extreme heat to extreme cold very quickly can also damage the resonator. For the most part, the largest hazard of the cold is dirt and particulates from the road becoming kicked up into your hot resonator. Installing resonators is not easy. Some resonators are easier than others. These resonators typically have mounting points on the body. Resonators with mounting points are much easier to install, but they are also a bit less durable. They will also provide your car with a bit less noise reduction because of the reverberation caused by the mounting holes. Generally, you will find that it is easy to avoid damaging your resonator so long as you weld or mount it on an area where it has a snug fit. Anything bigger or smaller increases the chances of causing damage. No, for the most part you will need to fit the exhaust resonator to the specifics of the car. The undercarriages of cars are not identical. Small cars will have much tighter confines in their undercarriages, which will make fitting the resonator much more difficult. Likewise, the diameter of the engine output may vary from car to car. The only problem is that dynomax mini bullet has no glass packing inside and does not reduce any noise at all. The author mixed it up with its bigger brother that does have packing inside and does reduce noise.